In 2001, I was invited to lead an “East African Theatre Workshop” in Kenya and Tanzania, working with many of the region’s top-level artists. That workshop began a life-changing journey. I found myself suddenly drawn to work outside U.S. borders. In 2003, I accepted a Fulbright teaching residency at Chinese University of Hong Kong, followed by an invitation as an Honoree at the 2003 Cairo International Festival of Experimental Theatre, featuring performance from throughout the Arab world. Surrounded by artists working in refugee camps, with trauma victims, in war zones, across disputed boundaries, and under severe censorship and repression, my definitions of what theatre or drama could be were expanding and forcing me to re-envision my role as an artist. Back in New York in 2004, I felt an urgency to create a mechanism to support theatre artists committed to international artistic exchange. My colleagues and I co-founded a group called Theatre Without Borders. We hosted our first public gathering at New Dramatists in 2005 and set up a website. TWB is a grassroots volunteer virtual community using artist-to-artist engagement and the arts as our language of communication across borders. In the past seven years, TWB has played a significant role in discussions about U.S. theatre in a global context and the role of artists in conflict regions throughout the world. This year we mark our six-year collaboration with the Peacebuilding and the Arts Project at Brandeis University with the publication of the Acting Together Project anthology and documentary. Working with the Sundance Institute Theatre Program, I have helped to create and implement Sundance Institute East Africa, working to promote exposure and exchange between U.S. and East African artists. I’ve also designed and produced international exchange with artists in Romania, an Iran-Israel-U.S. theatre collaboration and a recent Iraq-Pakistan Exchange Project, in collaboration with Golden Thread Productions in San Francisco. Over the past decade I have turned my focus almost exclusively to international theatre exchange. At the same time, I can increasingly see how these journeys amplify and enrich my commitment to my own country and culture. 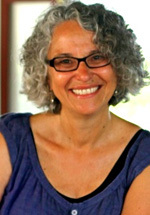 Roberta Levitow has directed in NYC, LA, and nationally. Currently Artistic Associate with Sundance Institute East Africa; co-founder and co-director of Theatre Without Borders; a co-founder of The Acting Together Project with Peacebuilding and the Arts at Brandeis University. Fulbright grants in Hong Kong, Romania and Uganda.